In this special guest post, Fiona Fitzsimons, Irish genealogy expert and director of Eneclann shares her insights into getting the most of the Griffith's Valuation records - all of which are exclusively available at Findmypast. Griffith's Valuation is one of the 'hidden treasures' of Irish genealogy, all the more surprising because it's so well known, by reputation. It's not a single document - Griffith's Valuation includes over 300 books and original maps. It is a detailed record of Irish landholding surveyed from 1846, and published between 1847 and 1864. Before 2003, no complete set existed, simply because no archive or library had the complete records. The only complete version of Griffith's Valuation is on Findmypast. Incomplete versions of this source are available on other websites, but they don't include records of up to 500,000 people. Another online version of Griffith's Valuation uses later editions of Ordnance Survey maps that date from forty to eighty years afterwards. By the early 1900s the Irish population had fallen by more than half, and these later maps don't show the farms and homesteads documented in the original survey. Online access to a definitive version of Griffith's Valuation, should have popularized it. Unfortunately many people still use it only as a 'census-substitute'. If this is your only use, then you're not getting the full benefit of this marvelous source. This is the reference number for every piece of property in a townland (generally the smallest administrative division of land in Ireland). Use this number to 'navigate' between the printed books and the maps. Capital letters A, B, C, D etc. represent parcels of the property divided by soil type. Lower case italicized letters indicate houses on the land plot. An italicized lower case 'a' denotes the house of the main householder. All other italicized letters b, c, d, e, etc. are used to identify habitable houses on the same plot. This has the name of the occupier – the person living on the land, often a tenant. This is the name of the landlord, or sometimes the middleman who sublet a holding. If land is held 'in fee', then the occupier owns the land.
'' meant the landlord's legal representatives negotiated directly with the tenant, and received rent for the land. 'In chancery' meant that the lands were under the control of the Law Courts. There were very many reasons why this might happen. if the owner died intestate, land was held in trust until a grant of probate. Columns 5 defines the area of the land in acres, roods and perches. An acre contained 4 roods; each rood contained 40 perches. A rood is about the size of a potato patch. Columns 6-8 sets out how much income the tenement can produce each year. This yearly income was the basis of the property tax, popularly known as rates. The bureaucrats that ran the scheme referred to the tax as the Annual Rateable Valuation (A.R.V.). The A.R.V. was charged in old pounds, shillings and pence - £.s.d. An old pound contained 20 shillings, and a shilling contained 12 pence. 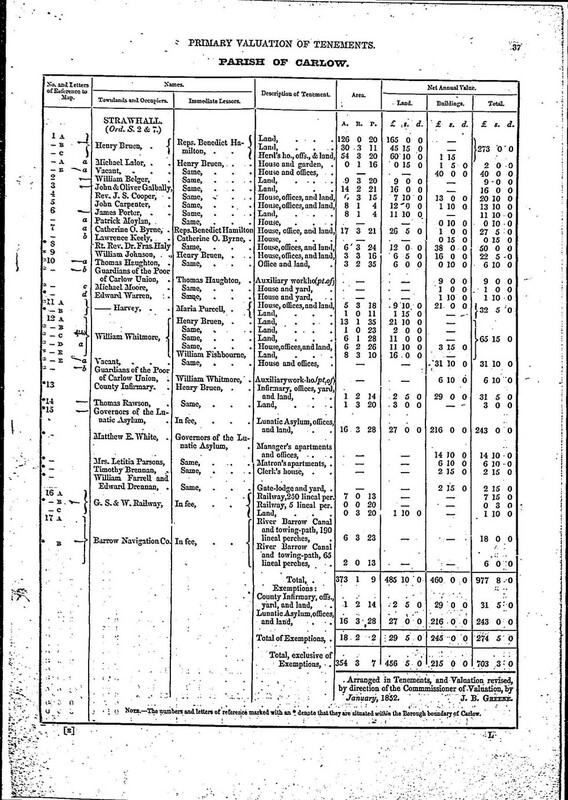 Column 7 is the yearly tax charged on all buildings on the tenement. Column 8 is the sum of tax charged on the land and buildings. By knowing the A.R.V. – the annual rateable valuation of the house your ancestors lived in, you can determine a lot about their living conditions. Property is always more expensive in the cities than in rural areas. A grand Georgian House on one of the fashionable streets in Dublin had an A.R.V. of between £50 and £75. A country house with an A.R.V. of £40 or over was a mansion house. In the countryside, including villages any house with an A.R.V. of £5 or more, was built of stone or brick with a slate or tile roof. It would probably have had a minimum of six rooms over two or more levels. Houses with an A.R.V. of between £2 and £5 were smaller. The walls were probably built of stone or brick. Houses on the upper-end of this scale i.e. £4 to £5 might have two levels. Houses on the lower-end i.e. £2 to £2.5s might have a 'dormer' level, and a thatch roof. Houses with an A.R.V. of less than £2 were smaller cottages of 2 and 3 rooms. At the very bottom of the scale you'll find houses taxed at 8s, 10s and 15s. These are the one and two room mud-cabins, with a thatch or turf roof. Townland of Strawhall, parish of Carlow, county Carlow. Top tip:Check the transcription to find the date of publication. In this instance 4th Jany. 1852.The records were published within 2 to 3 months of the survey. Lot 1C a herd's house and land on 54 acres 3 roods and 20 perches. Bruen sub-let a cottage on Lot 1A, to Michael Lalor, who was Bruen's main tenant. A large mansion-house, presumably Benedict Hamilton's own residence, was left vacant on Lot 1B. Bruen also left the herd's house vacant on Lot 1C. Bruen paid £273 in annual tax, of which £3 was for the buildings, and the remainder for land. Griffith's Valuation is a 'gateway' source for other records, many of which are already available on Findmypast. Check out our top 5 essential record sets for discovering your Irish heritage.